The Upper Spiš town of Podolínec is situated in the Poprad River valley on the old trade road from Poprad to Kraków. The oldest written references to the settlement date back to the period when this territory was not definitively incorporated into the Old Hungarian State and Duke Boleslav of Kraków considered it a Polish domain. Duchess Kunigunda of Kraków and Sandomierz renewed the mayor´s deed for Kraków burgher Henrich in 1289 after the devastating Tatar invasions of 1241 and 1244. However, the location was settled by Germans, Slovaks and Poles in even earlier times. The King confirmed the hereditary right of mayoralty to Henrich and municipal privileges according to Magdeburg law. Podolinec was definitively joined with Old Hungary in 1292. The oldest building in the town is the apse of St Ann’s Chapel at the cemetery. Its location indicates the larger ground plan of the town. The market centre had the right to mill, the right of sword and the important right of storage as the first town in Slovakia. Municipal fortifications played an important role in the region, and the inhabitants of Hniezdne and Stará Ľubovňa had to contribute to the maintenance of the town walls, built in the early 14th century, because they functioned as a refuge for them. One of the bastions still stands at the former upper gate. The northern part of fortifications and both municipal gates were pulled down in the 19th century. In the period of an imminent Hussite threat, King Sisigmund of Luxembourg permitted J Perényi to build a small fortress near the lower gate in 1408. It successfully resisted the Hussite assaults in 1441. The castle later lost its significance and its original four-storey building became the part of present day town hall. In the centre of the lens-shaped square, which had taken shape alongside the long-distance route and slightly narrows to the south, stands the original 13th-century single-nave parish Church of the Ascension of the Blessed Virgin Mary. The church includes a rebuilt gothic tower. Gothic wall paintings date from the period of its renovation in the second half of the 14th century. The prismatic belfry, with its gable attic and graffito decorations, was built near the church. In April 1412 Podolínec was promoted to a free royal town and became one of the most important centres of the country. However, in the same year the King forfeited Podolínec and another 13 Spiš towns to the Polish king. Apart from trade, crafts also contributed to the development of the town. The boot-makers of Podolínec were the first in Slovakia to get their guild articles. The town became famous for fabrication of knives with precious decorated handles. Renaissance burgher and craftsmen houses built in rows along major thoroughfares form the basis of the town structure. A turning point in the architectural development of the town came in 1642 during the 30 Years War when the Piarist order from Moravian Mikulov was awarded the foundation charter for a monastery. The Piarist College opened its doors in 1643 and was attended by students from Poland, Moravia, Hungary, Romania and what later became Yugoslavia. A Piarist Grammar School and hostel opened in the same year and would remain operational until 1919. The Redemptorist Church consecrated in 1651 was built according to the plans of the Vienna architect Poschberger. A couple of characteristic slender towers were built in 1762. In 1772 Podolínec was returned from Polish forfeit to Hungarian rule after 360 years. 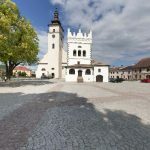 In spite of its college and the favourable period it initially enjoyed after rejoining Hungary, it eventually lost its urban character and sank to the level of a small provincial town. The older building that had been previously the part of the castle was adapted to the needs of a town hall and still serves this purpose today. Podolínec has maintained the features of the Gothic-Renaissance Spiš town. With its preserved architecture it ranks among the most valuable elements of Slovak cultural heritage. The Slovak Government declared it a Town Conservation Reservation in 1991.